Smart Pots Patented Aeration Containers Grow Better, Healthier Plants! Nurserymen and Master Gardeners alike have known for over thirty years that Smart Pots grow better plants because of the fabric used in their construction. The tough, long lasting Smart Pot material has just the right amount of porosity to promote air root pruning, excellent drainage and allow excess heat to escape, producing superior plants. The patented soft-sided containers last for years, even in the harshest winters, and are excellent for growing the widest variety of container or potted plants. A healthy, well-established root system is key to overall growth, and Smart Pots provide roots with an ideal environment, allowing them to thrive and develop to their full potential. Vegetables, flowers, herbs and fruits all do well in Smart Pots. Smart Pots are the horticulturist’s first choice for container gardening! Smart Pots are 100% made in the USA. All of our raw materials and manufacturing processes are sourced in the USA. Our fabric is totally inert and free of chemicals and BPA’s. As roots grow in containers they eventually reach the container walls. In hard-sided containers, these roots, upon reaching the walls, start circling and continue to circle, seeking a friendlier environment. Upon examination, these root systems exhibit a few strong roots growing in circles with very little branching, often are bound or girdled upon themselves and, depending on the type of plant, can produce a strong tap root growing through the containers bottom. These characteristics can hinder the plant’s rate of growth and in some cases its chances of survival when transplanted. Roots grown in a Smart Pot come in contact with the fuzzy, fabric inner wall of the bag and penetrate or grow into the fabric. The bag’s tough fabric prevents the root’s continued longitudinal growth, in effect pruning it, causing the root to develop masses of lateral fibrous roots. 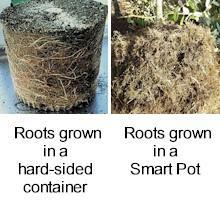 Upon comparison, root systems that developed in a Smart Pot have a much greater mass or volume then those found in hard-sided containers. Plants grown in Smart Pots have root balls that contain many more roots than found in a hard-sided container of similar size. The fibrous root systems produced in Smart Pots are more efficient and enable plants to maximize water and nutrient uptake in the limited surrounding soil mass. 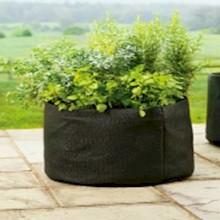 The Smart Pot’s black fabric quickly warms up early season soil, enabling plants to get off to a quicker start. Yet the same fabric, due to its porous nature, allows heat to escape from the container through evaporative cooling during the summer’s hottest days. Even in northern climates, root systems of container-grown plants can be damaged from too much heat. University studies have also shown a direct relationship between soil temperature and slow-release fertilizer activity. 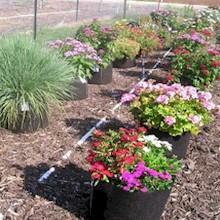 Cooler containers do not allow for premature fertilizer release. Gardening indoors can be as fun and rewarding as gardening outside. It can also be less of a headache! When you garden inside you bring everything to your plant: light, water, and food. 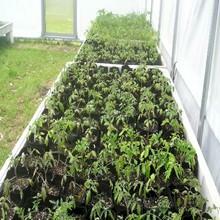 Using a hydroponic system is one of the best methods to do this. When you garden using hydroponics you control everything. Your system delivers everything your plant needs so all your plants have to do is grow. When you’re indoors you’re in charge. The hydroponic industry for a long time has done a great job in providing the hydroponic hobbyist a nice selection of good quality lighting, nutrients, additives, pH testers and balancers. But it has had a limited selection of containers. This meant that the gardener was forced to place their plant in a system that provides the best light, the best food, and an environment for optimal performance. However the container they had available for use was limited. The Smart Pot is made of a porous fabric which allows water to flow freely while keeping medium inside – no more clogged hoses. The Smart Pot air prunes the roots which creates more roots through branching; more roots means more root tips and more opportunity for the plant to feed. The Smart Pot stimulates beneficial bacteria because of the aeration – beneficials need oxygen. The Smart Pot allows the plant to use all the space inside the container for root growth, thereby letting the plant grow bigger than traditional hydroponic containers allow. The Smart Pot doesn’t allow roots to circle, making it the ideal container for a mother plant. The Smart Pot releases heat, keeping the plant free from stress. Give your plants what they want: room to grow, air to breathe, and an environment to thrive. Give your plants the Smart Pot!